Great House in the heart of Nuevo Portil, a hundred meters from the beach. 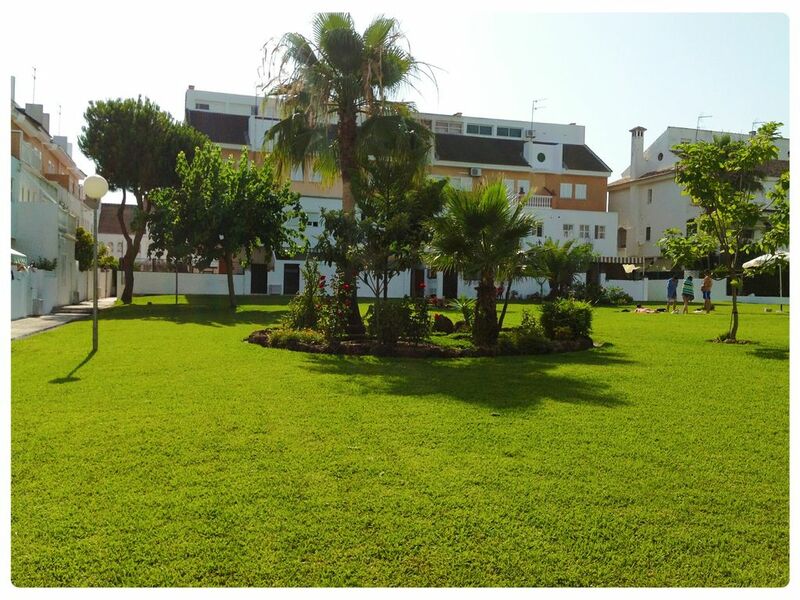 In a private complex of 20 units with communal pool and 2000 m/2 garden. Tastefully decorated and renovated in 2011, has air conditioning and heating with two beautiful terraces with many plants and gas barbecue with mineral stone. The house has two floors with no elevator as is not recommend for handicap guesses. It has binoculars for nature visits. There are books and DVD movies at home. It is located in the heart of El Portil therefore less than one hundred meters offers sports complex: tennis, golf, basketball, gym. Restaurants, bars, supermarkets, medical center, pharmacies, ATMs, ice cream shops and seafront are available at walking distance. Natural area with 10,000 hectares of pine which has not suffered the urban disaster in the Mediterranean. Portugal is 30 minutes (Algarve Coast) and the Coto Donana an hour by car, also perfect place for golf players, and amazing natural beaches. Huelva Province is actually several holiday destinations in one. You have the stunning wide sandy beaches along the coast with stretches of unspoilt coastline which has not suffered the over development of the other costas; the mountains in the north of Huelva and the abundance of natural parks and nature reserves that cover a third of the province. Within this varied province is Nuevo Portil, the jewel of the Huelva coastline. Backed by protected pine forests and leading directly to the beaches it is an exclusive destination that is popular with both golfers and summer tourist alike. Golfers are spoilt for choice in this area. Nuevo Portil has its own golf course, with El Rompido, Costa Esuri, Islantilla, Isla Canela and Bellavista golf courses all less than an hours drive away. As if that is not enough, Huelva is right on the border with Portugal so you can also take advantage of some of the best courses in the Eastern Algarve. Families will find plenty of activities to keep the children entertained - although children most often like to spend the entire holiday in the sunshine either our pool at the house or exploring the beautiful sandy beaches. Muchas gracias por tus comentarios, esperamos verte muy pronto. Hemos estado muy a gusto y ha merecido la pena el viaje tan largo. Enrique en todo momento ha estado pendiente de nosotros. Da gusto contar con un anfitrión así. Muchas gracias por pasar estos días en nuestra casa del Portil y por tus comentarios, Esperamos verte pronto.!!! El dormitorio del atico no tiene cortinas. Si no puedes dormir con luz, esta casa no es para ti!! Muchas gracias por tus comentarios, en la descripción de la vivienda advertimos sobre las escalera y que la vivienda no esta recomendada para personas con descapacidades. Respecto a los niños, nuestra propiedad está recomendada para niños y recibimos excelentes críticas de familias con niños. Trabajamos cada dia para escuchar a nuestros huespedes y mejorar nuestras instalaciones, para que las estancias sean optimas. Todo genial, excepto él hecho de tener que utilizar las escaleras para acceder a la casa. Todo muy bien. Lo único que nos ocasionó alguna dificultad fue tener que subir un piso para acceder a la casa, ya que la planta de abajo es un apartamento independiente. Salvo eso, que no nos quedó claro al alquilarla, todo muy bien. La casa está bastante bien,consta de tres plantas.En la primera salón ,cocina ,terraza y baño.En la segunda 3 habitaciones y baño;y la tercera es una habitación grande con baño. Tiene de todo no hace falta llevar nada.